The Sling School: Coming Soon!! 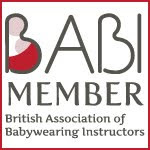 The Sling School, Manchester's babywearing consultancy. Classes for parents to be and parents of newborn babies, (up to three months) starting in January 2012, watch this space for more details.